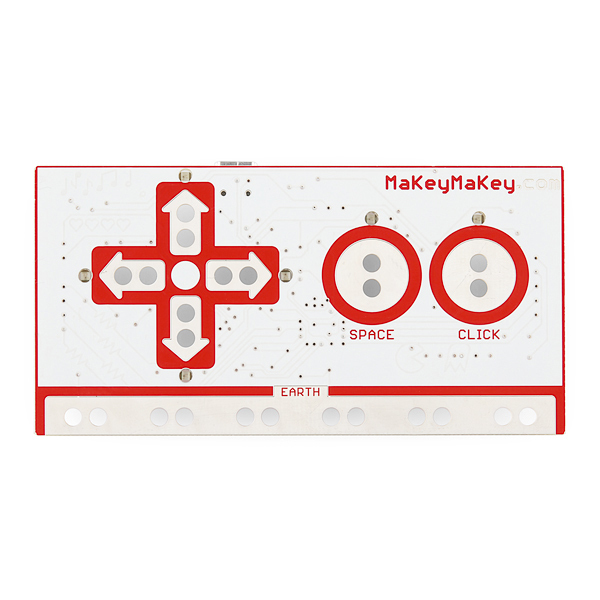 Makey Makeys are fun for all the family and excellent way to get younger ones interested in programming. It feels a bit weird writing a tutorial on how to use them, as it really is incredibly easy, so consider this more of an inspiration piece. 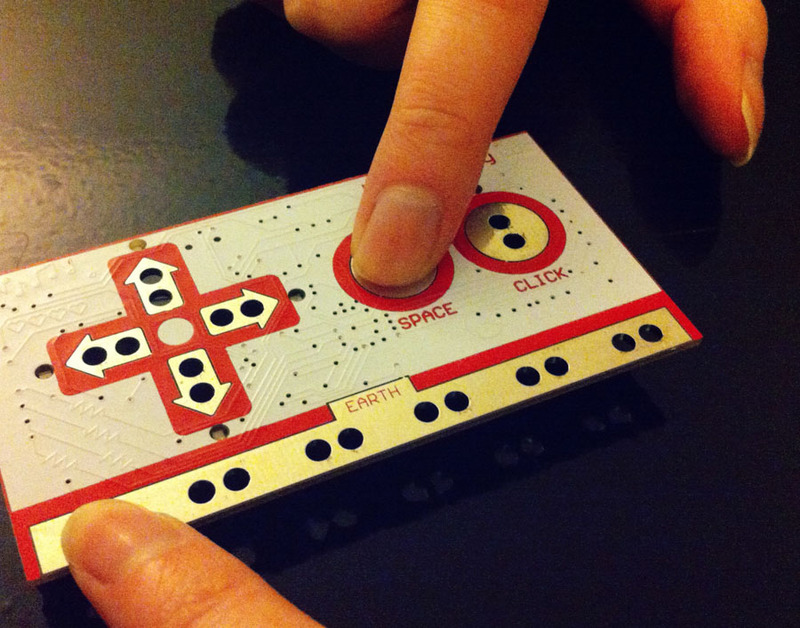 The MaKey MaKey is a printed circuit board built on top of the arduino, it let’s you easily turn anything that conducts electricity (even just a very small current) into a key, button, or gamepad. Out of the box it works with the arrow keys, spacebar, and mouse left click which let you play a whole range of awesome games without any programming required. Turn the board over and you find the keys W, A, S, D, F, G, and ‘mouse up’, ‘mouse down’, ‘mouse left’, ‘mouse right’, ‘right click, and ‘left click’. There are also 6 outputs for using the board in ‘arduino mode’. In arduino mode, it can do anything an arduino can do like spin motors or turn on LEDs. If you wish to use a different set of keys, or otherwise change the behavior of your MaKey MaKey, you can just reprogram it using the Arduino environment. The front is set up for easy alligator clipping, the back can be accessed with jumper wires (or safety pins/paper clips). Out of the box you have access to 18 different inputs (the 6 on the front and the 12 on the back), and up to 6 can be pressed at once. If you are lucky to have more than one MaKey MaKey, you can connect several to your computer at once! All you need is a usb port. (I only had 3 so could only test up to that number, let me know if you do more). So let’s get started, connect your MaKey MaKey to your computer of choice with the USB cable. It should just work out of the box, you can ignore any pop up messages. (Like the mac asked me to configure my keyboard, but it’s not necessary, I just closed the window). Open a text editor, place your cursor at the beginning of the document, touch the ‘ground’ strip with one hand, and then touch ‘space’ with your other hand. Can you see the cursor moving? 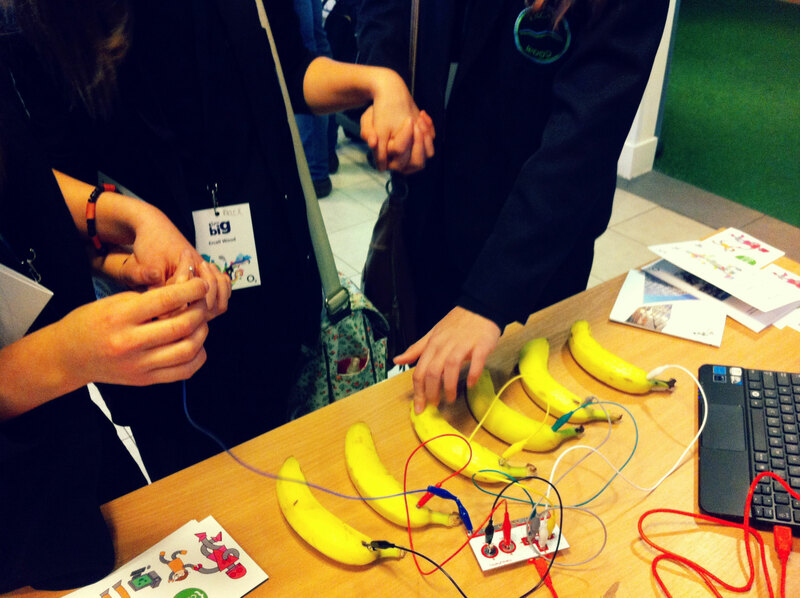 The hello world of MaKey MaKey’s is the banana piano. Alligator clip the front inputs (arrow keys, spacebar, left click) to some bananas, hook it up to a simple program that says ‘if up arrow is pressed play C, if right arrow is pressed play D’ etc. I used this simple Scratch program (which btw, is a great way to teach children programming). But you don’t have to stop with bananas! Inspired by the Fun Theory, we turned some stairs into piano keys. We used copper wire to line the stairs, and had the rail wired to the ground. Excuse the poor quality video taken with my mobile, but you should get the idea. Everything conducts electricity as long as you put a high enough voltage through it, but for the purposes of the MaKey MaKey, here’s some ideas of what to use. Snowmen (consisting mostly of water and carrots, snowmen make great triggers. It’s up to you if you want a happy snowman singing xmas carols, or perhaps some more sinister Doctor Who style snowmen that say ‘don’t talk to them, they are silly, you don’t need anyone else, I can help you’ as someone walks up to them, hehe). It is worth noting that anything that does not conduct electricity can be made to conduct electricity by use of copper wire or conductive paint like this one from Bare Conductive. I’ve tested the conductive paint on lego, and it works a treat! 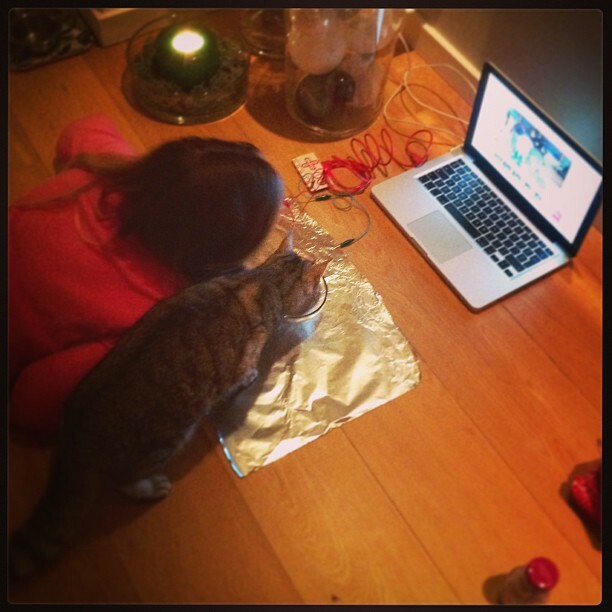 The most popular thing i used my MaKey MaKey for this Xmas was a simple pet camera. 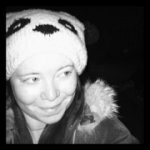 I used photobooth on my computer, but you can use any photo program you want as long as it can be triggered by a key input. I had mine setup to work with the left mouse click. I laid a sheet of tinfoil on the floor, which was then connected to the ground. I then connected an alligator clip to the left mouse click, and to a glass bowl, which was placed on the tinfoil. I filled the bowl with catmilk (you can also use water). Since glass does not conduct electricity, this setup does not close the circuit. Cats however, do conduct electricity, and when they come along and step on the grounded tinfoil, and sticks their tongue in the milk – photobooth is triggered. 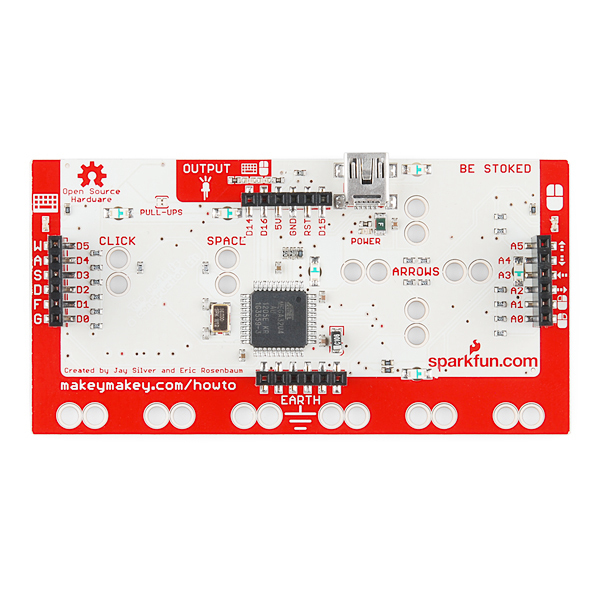 MaKey MaKeys can be bought from Sparkfun in the US, Firebox in the UK, or even Amazon. Linda is and interface developer & wannabe MacGyver. Recently done @h8ppenstance, @lastfm UX internship, and @codeclub. Failed MongolDerby '12. Likes Tesla, bots, blimps & beams.